This second deferment is a reaction to the stunning Postal Regulatory ruling on the CPI price change. No one expected this outcome. The possibility should have been communicated, and it wasn’t. Although this give the USPS a scapegoat to blame for the delay, and will give USPS more time to plug holes in the PostalOne! ship, it is a bad to require, regulate and renege on a regular basis. Credibility takes a huge hit. Also unsettling in the communication below are the references to Full Service benefits (they built it, everyone didn’t come) and to the IMb Small Business Tool. Small businesses should rely on a mailing service provider or software to navigate all the regulations and provide the correct documentation to meet USPS requirements. The Branded Color Mobile Technology promotion provides business mailers with and up front two percent postage discount on Standard Mail® and First Class Mail® letters, flats and cards (presort and automation). The U.S. Postal Service’s 2014 promotions calendar, officially announced this week, reprises popular programs with some new wrinkles aimed at increasing use of First Class, shipping, and digital technology. The biggest rate discount being offered, 15%, is for a spring promotion for First Class marketing pieces. via USPS Confirms 2014 Direct Mail Promotions – Direct Marketing News. I will be serving a second term on MTAC Leadership starting in January, continuing in the are of Service Performance and Informed Visibility. An effort involving the collaboration of unions and management is underway at plants across the country to transform the way USPS processes the mail. It’s called Lean Mail Processing and includes a certification program. Part of the Network Optimization DRIVE initiative, Lean Mail Processing is being implemented at 76 plants throughout the network. To date, the South Jersey P&DC, the site of a lean processing pilot, and the Margaret L. Sellers P&DC in San Diego District have earned certifications. The program will expand to the remainder of processing facilities beginning in January. via USPS News Link Story – Better than ever. The issues are still being resolved, but ‘mail.dat’ services are available. We are continuing to bring the other services online and will communicate accordingly. We apologize for any inconvenience. You are receiving this email because a Critical Incident ticket was opened by the USPS Help Desk for an issue that is impacting PostalOne! performance and availability. The root cause is being investigated. We are working aggressively to eliminate the root cause and will advise when it is cleared. You will be notified when the resolution is implemented. Robert Cintron, currently manager of Western Pennsylvania District, has been appointed the Postal Service’s new Product Information VP, reporting to CIO Jim Cochrane. The appointment takes effect Dec. 14. PMG Pat Donahoe said Cintron will be responsible for managing innovations in technology and information systems, including the Intelligent Mail barcode and Address Management Systems. Cintron also will lead the Postal Service’s ongoing initiative to use technology to add value to the U.S. Mail. Among other duties, Cintron will share responsibility for developing new package sorting equipment and overseeing continuing technology development to enhance last-mile capabilities for parcel distribution and dynamic routing. 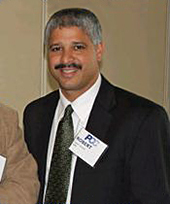 Robert Cintron, who will become Product Information VP Dec. 14, at a 2012 PCC Week event. via USPS News Link Story – Cintron named VP, Product Information. I had the opportunity to meet Mr. Cintron at MTAC this week. Looking forward to working with him in the coming years.